Apologies for my recent lack of updates.. Since racing Pan Ams about a month ago, I've raced The Tour de Grove in St.Louis, the GP cycliste de Gatineau and even went home for a few weeks! 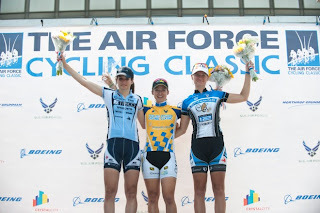 Most recently I raced the Airforce classic in Arlington, VA (which I discovered is actually just across the river from Washington, DC- my knowledge of US geography is vastly improving this year!). Tour de Grove was very cold and rainy. 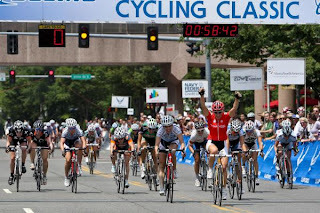 Colavita did still manage to pick up some podium spots that weekend. Kelly placed third the first day, and the second day Edita placed first with me in third. The finish was chaotic when a girl took the corner too hot and sparks flew off her bike as it hit the ground! GP de Gatineau was really fun, you get to wind around on-ramps and off-ramps and there is a round-about 300 m from the finish. I was in a break for a good part of the race which was fun. We didn't stay away though. Denise Ramsden (Juvederm) countered and got a decent gap on the field. I tried to bridge across, but it just wasn't going to happen. It all came back together for a crazy bunch sprint. Thankfully the girl who crashed at the roundabout this year only crashed herself and not half the field like last year... I ended up fourth in the sprint, which I was happy with! Also Colavita took 1st and 3rd which was sweet! ( I was racing with Team Canada). That brings you pretty up to date. Just this past weekend was the Airforce Cycling Classic where I managed to pick up my first NRC win ever! It was a bit of a Tibco/Colavita showdown since both teams had full 8 rider squads. The race consisted of two crits, and an overall omnium title. Heat was definitely a factor for the day with the sun beating down. Despite many attacks and small breakaway attempts the first day, the race came down to a bunch sprint. I finished second to Joelle (Tibco), while Lauren from Colavita joined me on the podium for third. We were both sitting in good spots for the omnium going into the next event, the Crystal Cup. Thankfully the predicted thunderstorm held off and we had good conditions to race the technical course. The race was once again really aggressive with attacks going left, right and center. The final break was brought back going into the last lap. Cath drove the pace around the last corner and up the last straightaway with me sitting on her wheel. This was a perfect set up for the finish and I was able to jump from her wheel and hold it to the finish to take the win, this also gave me the overall omnium win for the weekend! I had so much fun this past weekend, it helps to have some amazing teammates to race and hang out with! Next up is the Nature Valley Grand Prix in Minneapolis, MN, starting tomorrow with a tt and crit! Hopefully the weather man decides his forecast for rain is wrong..
PS: If you have Facebook and are reading this, you should really go "like" the Team Colavita page on Facebook to get updates on all the racing!